The Irish Hill Neighborhood Association depends upon you, its members, to make it effective. 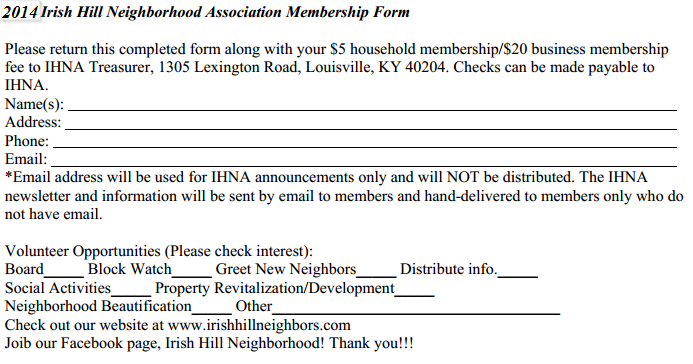 Be a part of all the positive developments in Irish Hill by joining or renewing your membership to the Neighborhood Association. Membership dues are only $5 household/$20 business per calendar year (January 1st through December 31st). Per our By-Laws, you must be a member by July 31st in order to vote for the Board of Directors or sit on the Board of Directors. Members starting after June 30th in any year can still vote on any other matter when the occasion is needed. Right click on the Membership form image, below and print it. Once you fill it out, you can mail it to the address provided.